While the 2018 edition marked the eighth running of the Tour de Bintan, it was just the second time that Southeast Asia’s premier amateur cycling tour also incorporated two qualifying races for the UCI Gran Fondo World Championships, a.k.a., those world amateur championships. The move by race organisers MetaSport to join the UCI Gran Fondo World Series (GFWS) in 2017 appears to have been an unqualified success, with vastly increased participatory numbers for the Tour de Bintan last year and then another boost in numbers for the just-concluded race. 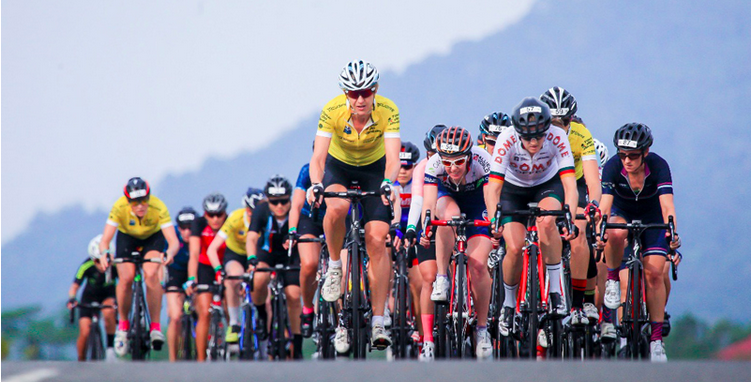 The Tour de Bintan is one of 21 qualifying races for the UCI Gran Fondo World Championships, and one of only three in Asia, alongside the Niseko Classic in Japan and the Dubai First Gran Fondo. But such has been the immediate success of the Tour de Bintan as a GFWS race, it’s already under consideration as a future site for the world amateur championships, according to GFWS manager Erwin Vervecken, who was guest of honour at the Tour be Bintan gala dinner on Saturday night. The action in the 2018 Tour de Bintan began with the Gran Fondo ITT on the Friday afternoon at Plaza Lagoi, a hotel/tourism hub at the centre of the Bintan Resorts zone.With the vast majority of competitors using ferry and/or plane connections to get to the race, the Tour de Bintan has always restricted the ITT to normal road bikes to make for easier logistics. Disc wheels, clip-on aerobars and aero helmets are also banned. This makes the Bintan time trial a real race of truth, with lungs and legs at a premium over fancy equipment. This article was first published on www.tourdebintan.com.